Taking its cues from its luxury boutique Loden Hotel in downtown Vancouver, Amacon’s Imperial infuses elements from the developer’s award-winning hotel into all of its homes at Imperial. The lobby, the amenities and the homes have been well considered, inspired by a “tailored to perfection” vision carried out through the design process. Rising 26 storeys, Imperial is named for its location on Imperial Street in the Metrotown neighbourhood, steps to everything this growing neighbourhood has to offer – restaurants, SkyTrain, parks, recreation and shopping. A hotel-style lobby will combine the look of luxury and with an elevated, full-service concierge to provide the sense of arrival one would expect upon arrival to a hotel. 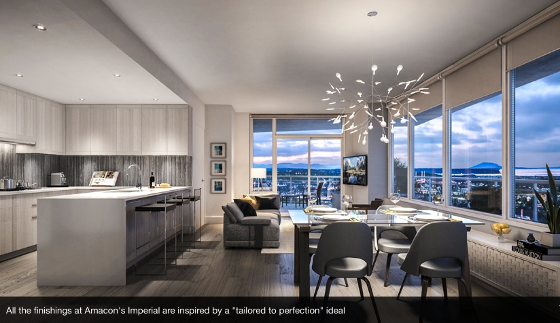 Offering a collection of 169 homes, Imperial is about choice, with one-bedroom through to three-bedroom tower homes, including a townhome collection, live-work homes and penthouses. Imperial is also all about quality time, whether it’s that quiet solitude on your spacious deck or in living room catching up on a good read while taking in expansive views, or family dinners, lovingly prepared in the well-appointed kitchen. Everything inside these contemporary homes is comfortable and well thought-out, built for the way people live today. With nine-foot ceilings, air conditioning, USB receptacles, a large-capacity washer and dryer, and custom organizers in the master bedroom closets, all homes include those interior design elements that speak to ease and comfort. In the kitchen, integrated appliances, full-height cabinetry, a convection wall oven, five-burner gas cooktop and polished-quartz waterfall countertops are included. In the bathrooms, Moen brand fixtures, custom medicine cabinets and a pull-out vanity organizer continues the tailored look and feel of Imperial. The private amenities space will be outfitted by a fully equipped fitness centre, a yoga studio, a business meeting room, a music room, a games room and a guest suite. A large social lounge will boast a social a full kitchen and two large dining tables, perfect for larger gatherings. The social lounge also opens to a large outdoor terrace with garden plots for those green thumbs. And if sustainability appeals to you, Imperial also offers a car- and bike-share program. With more than five decades of excellence in the industry, Amacon has a stellar track record. Opening in October, the Imperial presentation centre, which includes a two-bedroom show home and two kitchen vignettes, is located at 4700 Imperial, Burnaby.